Summary: Long, long ago in a land far away, lived a perfect little tree named Small Pine. Small Pine hoped to maintain its perfect form and be selected by the Queen as her Christmas tree. But as the warm-hearted little tree gave shelter to rabbits, birds, and deer in the forest, its branches became damaged. The other pines mocked Small Pine, and it never thought that it would be eligible to be the Queen’s Christmas tree. However, on the first Saturday of Advent when the Queen came into the forest with her woodsmen, she noticed Small Pine and all the animal tracks leading to and from the tree and she had compassion on it. She claimed it to be the most beautiful tree of all and presented it as her Christmas tree to the rest of the kingdom. Literary elements at work in the story (Genre/setting/characterization/plot/theme/point of view/style): This story is written in the third person and reads like a fairy tale of long ago with all the magic and wonder of far off places of kings and queens, and the main character is a simple small pine tree that offers love, warmth and compassion to all the wildlife in the forest. It is through this love and compassion that the Queen offers the pine tree the most prominent place in the kingdom as her Christmas tree. Each illustration consumes the page and invites you into the story of Small Pine. (How) does the perspective on gender/race/culture/economics/ability make a difference to the story? This story is not about a boy or a girl, black or white. It is about a pine tree that offers support and shelter to the meek and lowly wildlife, even in the midst of ridicule from its friends, the other pine trees. The perspective of the pine tree, then, is not tainted by one’s cultural biases. Every reader can enter the story with their own experience and relate to the pine tree’s choices of helping others. Theological conversation partners (scripture, confessions, doctrines, theologians, etc): The theology of this book comes explicitly from the author in the closing sentences: “living for the sake of others makes us most beautiful in the eyes of God.” As the body of Christ, we are called to do the work of Christ, to get our hands dirty and reach out with compassion to help those in need with the gifts and talents that we have. At the Sermon on the Mount, Jesus says, “Be perfect as your heavenly Father is perfect.” (Matthew 5:48) To be perfect does not mean to be without blemishes or faults, rather it is to be complete and whole and to live whole-heartedly for God and others. The Small Pine made very difficult choices in this book. It would have been very easy for it to turn away from the rabbits, the birds, and the deer, just like the other pine trees. Have you ever needed to make a tough decision? Did you talk to anybody to help you make the right decision? Where can you go for advice on making good decisions? The other pine trees made fun of Small Pine when its branches started to droop from helping the animals in the forest. How do you think Small Pine felt? What do you think of Small Pine for continuing to help the forsest animals, even though it meant that it would no longer have perfect branches? What are some ways that you can live for the sake of others? This review was written by Union Presbyterian Seminary student Amanda North. 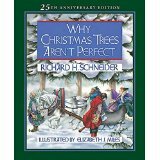 Why Christmas Trees Aren’t Perfect by Storypath is licensed under a Creative Commons Attribution-NonCommercial 4.0 International License.